Stock photo of a costumed interpreter outside the jailhouse at Fort Walsh National Historic Site, Cypress Hills Interprovincial Park, Saskatchewan, Canada. A man in a brightly colored costume stands next to the jail at Fort Walsh National Historic Site. 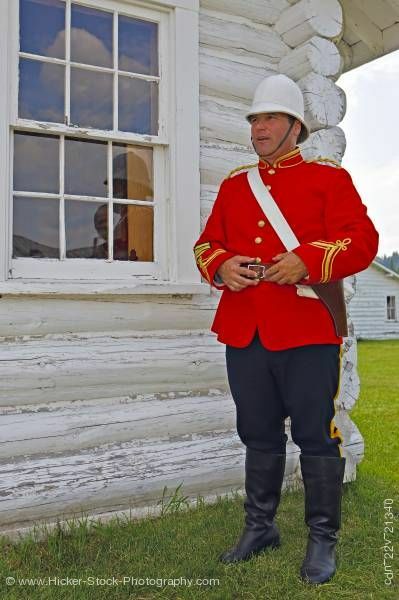 This stock photo shows a costumed interpreter outside the jailhouse at Fort Walsh National Historic Site, Cypress Hills Interprovincial Park, Saskatchewan, Canada. A man in a brightly colored costume stands next to a white log structure. He is wearing a white dome hat with a black strap around his chin. The jacket is bright red with gold trim on the collar, shoulders, and arms. The log cabin is painted white and the cracks in the wood can be seen. The cabin has a glass window which reflects the interpreter and the blue sky. Costumed interpreter outside the jailhouse at Fort Walsh National Historic Site, Cypress Hills Interprovincial Park, Saskatchewan, Canada. Model Released.